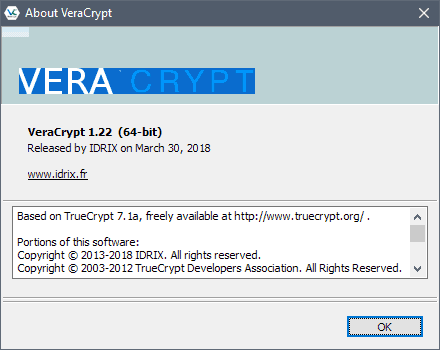 VeraCrypt 1.22 is a new version of the popular cross-platform encryption software that parent company Idrassi established as the primary unofficial successor of the encryption software TrueCrypt. TrueCrypt development ended under mysterious circumstances in 2014. The developers published a message on the project's website and as part of setup that stated that TrueCrypt was not secure to use. An audit in two parts -- see the article on the results of the first and second part of the audit -- concluded that TrueCrypt had no backdoors but that it had some vulnerabilities. Programs based on TrueCrypt launched soon after the end of TrueCrypt, and TrueCrypt users started to switch to programs such CipherShed, VeraCrypt and other TrueCrypt alternatives. VeraCrypt is based on TrueCrypt code and one focus of development was to resolve any security issue that might be in the code. The developers released several security updates, VeraCrypt 1.15, VeraCrypt 1.17 and VeraCrypt 1.18 which resolved TrueCrypt vulnerabilities or other security issues. VeraCrypt 1.22 is the first update of the software program in 2018. The last update dates back to July 2017. VeraCrypt requires manual updating as the software program does not support update checks or automatic updates. You need to head over to the project's website and download the new version for your operating system to update it manually. Windows users may download the installer or a portable version. It may be necessary to restart the system to load the updated VeraCrypt driver on the system. The Windows version of VeraCrypt received the bulk of improvements, fixes and updates. The bulk of changes fix issues that affected some machines running Windows. Some examples: the new version fixes an issue that caused the hidden operating system to fail to load on some machines, the incorrect parameter error during the mounting of volumes on select machines, and a rare case of applications freezing during mount and unmount operations. One new option implemented for Windows versions of VeraCrypt is support for blocking the TRIM command for system encryption on SSD drives, and an option to enable TRIM support for non-system SSD drives. You can check out the full list of changes on the official project website. Now You: Do you use disk encryption? If so which software do you use? I wish we would know more about then end of TrueCrypt by now. Was there really no additional information found out in all these years ? As for VeraCrypt, I was initially sceptical but I think it has undergone its own independent code review later on and should now be fine. I’ve recently seen a list of programs that France recommends internally for use by various public agencies. The list was presented as “Type of program”, “Program recommended”, and there was only one or two programs recommended per type. VeraCrypt was listed, but with the mention that it needed to be (code, I think) reviewed. So that’s a fine sign in my book. Sorry, no source, this paper is going to be hard to find again. @Sumatra, the list you mention is freely available there : http://references.modernisation.gouv.fr/socle-logiciels-libres you can download the PDF file on the right side. VeraCrypt is in category Encryption\Disk Encrytion. I use Truecrypt still for everything except FDE, and it’s fine for that still. Say you have a HDD with FDE in one Windows bootable partition, you buy a SSD of the same size and you do a sector by sector copy. Thus, no previous data on SSD, and after only encrypted data. Why will be TRIM a problem (correct me if I’m wrong) if whatever data TRIM moves has to be already written on disk and that data is always encrypted? Any pre-backdoor version of TC is fine by me. Anything after that I stay away, whatever I hear or read. The nutjob conspiracy theory aspect of it does not escape me but this is the one theory that makes any sense at all. Besides, this novlang (newspeak) item -conspiracy theories- is a defacto blanket gag order on quite some dissenting opinions. Therefore, it has to be ignored, which I do in this case. I don’t disagree with the sentiment, however both truecrypt and veracrypt have always been open source, you can diff the code bases, truecrypt had some quite nasty flaws found, and vercrypt has had many of those flaws fixed, along with some very talented anti backdoor people give it the ok. So i disagree with your conclusion. Is there a version of Veracrypt available for the 64 bit version of Mac OS (High Sierra) that will continue to run when Mac OS switches completely to 64 bit software?